Two and a half years to the day since the world’s worst-ever single mass killing of journalists took place in the southern Philippines, many suspects remain at large, the trial is stalled, and victim’s families are being harassed and intimidated. 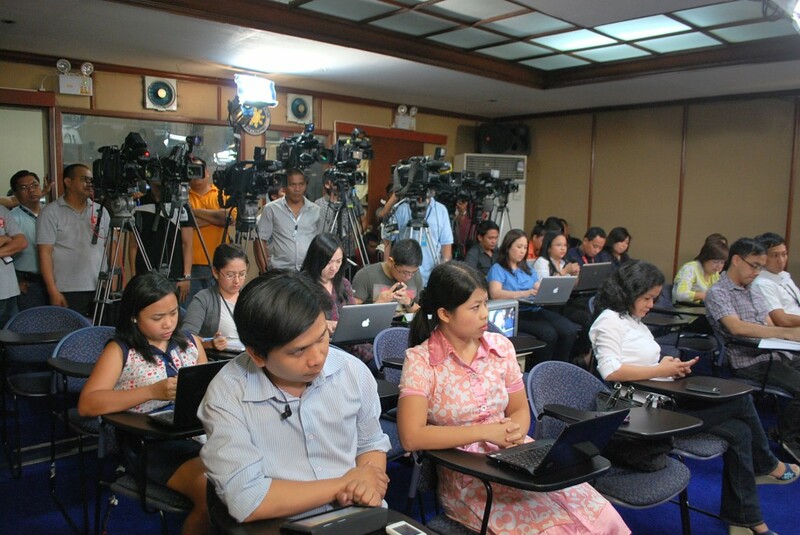 MANILA – Most days, Philippine presidential spokesman Edwin Lacierda does a White House-style briefing with Manila’s press corps, spinning the Malacañang Palace line on the latest news and policy developments and fielding questions from the journalists wedged into high-school type desks and shoehorned between a mass of cables, cameras and audio gear. The vibe is relaxed, even jocose, but the questions are sharp, and if Lacierda doesn’t answer adequately, the reporters press harder. As it should be, and with the country’s chief justice facing impeachment in a high-profile trial as well as an ongoing stand-off taking place with emerging power China over disputed islands off the Philippine coast, there’s some big news in the Philippines these days. But news comes with risks in this country. Since 1986, 125 journalists have been murdered for work-related reasons, according to the Manila-based Center for Media Freedom and Responsibility (CMFR). With midterm elections coming next year, journalists in the Southeast Asian island nation would do well to raise their guard. “We are currently identifying areas in the Philippines where violence increases around election time,” Lacierda said, when asked about a possible spike in attacks on journalists in the run-up to the polls. Pañares, who is president of the Palace press club, lamented that “most of the cases go unsolved,” but added that reporters based in Manila have it easier than counterparts working in rural areas or in smaller cities elsewhere in the country. CMFR ran the numbers, and out of the 125 dead, only four were based in the sprawling, chaotic capital. Melinda Quintos de Jesus was a reporter in Manila back in the mid-1980s, when the country made world headlines with massive — and ultimately successful — street protests against the country’s U.S.-backed dictator Ferdinand Marcos. The upshot is that though the country’s media is formally free — and is without doubt outspoken, even brash — journalists put themselves at risk by offending so-called big players. There is little hope for redress, in most cases, as the vacuum affects more than the media. De Jesus lamented that “the culture of impunity affects all other aspects of society.” Of the 125 journalist murders, 14 cases are ongoing, but all told there has been only 10 convictions over the years, according to CMFR. Police often to try whitewash hits on reporters as love triangle vendettas — perhaps a meme that resonates in a country where maudlin romantic ballads are popular — but it means that hired guns and those behind the hits almost always get away with it. So brazen was the slaughter it prompts the uninitiated to wonder how the accused thought he could get away with it. “The Ampatuans (the southern-based warlord-clan accused of ordering out the killings) thought they were untouchable due to links with Arroyo (Gloria Macapagal Arroyo, then-president of the Philippines),” de Jesus said. Mary Grace Morales lost her husband and sister — both journalists — in the slaughter. She is secretary of Justice Now, a support group for families of the Maguindanao victims. Speaking on the phone from Gen. Santos City in the southern Philippines, she said victims’ families are being harassed and threatened still. “Two of the families are being followed on motorbikes and being sent text messages from people linked to the killers,” she said. Another challenge for her newspaper is dealing with the changes wrought by new and social media. The Philippines has the eighth-highest Facebook uptake of any country, with more than 27 million accounts, according to analytics company Socialbakers, but that is in a country with a relatively low overall Internet penetration. Of all web users in the Philippines, 91 percent have Facebook accounts. “All the time things are spread on Twitter that turn out false or different afterwards,” she said. That’s where newspapers come in, of course, if they do their job well. Hence the “responsibility” tag to CMFR’s mission. “We have too much media in the country,” said de Jesus, wrinkling her nose at the use of “block time” (effectively pre-paid dressed-up PR masquerading as discussion) on the country’s talk radio. New news sites such as Rappler have caused a stir, though it is perhaps too early to say if they can cut real inroads into the country’s news market. Most established newspapers are online and have been for many years, with smartphone apps long in place.